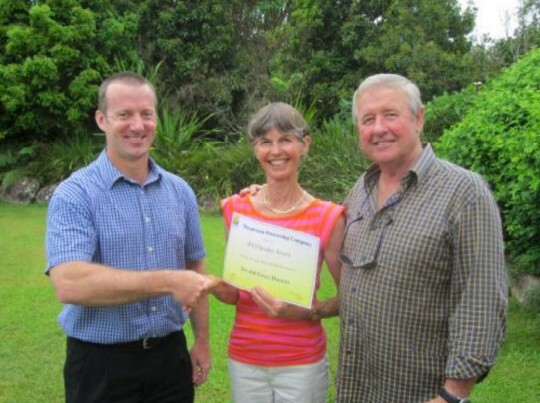 Local Valla growers Jim and Gwen Duncan have won the 2012 Macadamia Processing Company (MPC) Quality Award for their macadamias, at a recent ceremony held to mark the end of the macadamia growing season. The Duncans achieved the lowest internal discolouration levels for their macadamias – a key measure of quality. They competed against all MPC growers from across Northern NSW and Southern Queensland. “In the past we harvested our macadamias and held them in a silo waiting for them to dry before re-sorting and sending them to the factory,” said Jim, reflecting on his win. “Now we use a new MPC system. Rather than keep the nuts in silos we harvest them and send them immediately to the factory which now takes unsorted nuts without reject penalties in their payment system. We are seeing great benefits in our quality and our returns thanks to MPC’s new system. The system makes the process of supplying quality macadamia’s easier and more profitable and that’s not only good for Nambucca growers it’s good for the Nambucca region”. This season MPC instigated a new system where growers can deliver their macadamias direct from the farm unsorted. MPC then uses state-of-the-art colour sorters to remove the reject nuts, with no penalty for growers. General Manager of MPC Steven Lee said the new sorting system also benefits the consumer. “We know the best tasting macadamias are the ones packed as soon as they’re picked. Through the changes we have made we are seeing the time between harvesting and packing reduced, and the quality of macadamias increase,” he said. “Our growers can now reduce their workload and costs and the amount of nut they throw out –improving their overall returns. Using the new system our growers are saving thousands of dollars per year” said Mr Lee. The award coincided with MPC announcing an increase in the final price paid to growers of 15c per kilogram. This brings MPC’s final price for the 2012 season to $3.25/kg at 33% saleable kernel recovery. Also at the award ceremony, Graham Bilbe, from the Comboyne Plateau took out the award for the highest average percentage of whole kernel for the season.